Glenn has worked at the Institute for Sport, Exercise and Active Living (ISEAL) at Victoria University since February 2010 following 15 years in the Departments of Physiology at Monash University and the University of Melbourne. He was the Research Leader in Exercise Science at ISEAL (2010-2013) and also the Leader of the Biomedical and Lifestyle Diseases (BioLED) Faculty Research Unit (2011-2012). He was then a program leader in ISEAL and is currently the ISEAL Metabolic Function research group leader and muscle stream leader at the Australian Institute of Musculoskeletal Science (AIMSS). His research examines the regulation of skeletal muscle glucose uptake during exercise and the factors regulating the increase in insulin sensitivity following exercise. 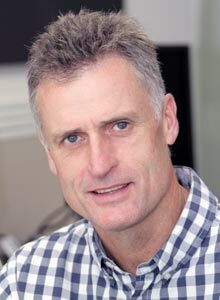 He also examines how exercise early in life following growth restriction in utero can prevent glucose intolerance and insulin resistance in adulthood.These studies have relevance for diabetes and indeed Professor McConell has been awarded five NHMRC project grants and several Diabetes Australia Research Trust grants. Hong, Yet Hoi, Tony Frugier, Xinmei Zhang, Robyn M Murphy, Gordon S. Lynch, Andrew C Betik, Stephen Rattigan and Glenn K McConell.. Glucose uptake during contraction in isolated skeletal muscles from neuronal nitric oxide synthase mu knockout mice. J Appl Physiol.118: 1113–1121, 2015. Hong, Yet Hoi, Andrew C Betik, Dino Premilovac, Renee M Dwyer, Michelle A Keske, Stephen Rattigan and Glenn K McConell. No effect of NOS inhibition on skeletal muscle glucose uptake during in situ hindlimb contraction in healthy and diabetic Sprague Dawley rats. Am J Physiol Regul Integr Comp Physiol. 308(10):R862-R871, 2015. Craig A. Goodman, Derk Pol, Evelyn Zacharewicz, Robert S. Lee-Young, Rod J. Snow, Aaron P. Russell and Glenn K. McConell. Statin-Induced Increases in Atrophy Gene Expression Occur Independently of Changes in PGC1α Protein and Mitochondrial Content. PLOS One. 10(5):e0128398. 2015. McConell, GK, G Kaur, F Falcão-Tebas, YH Hong, KL Gatford. Acute exercise increases insulin sensitivity in adult sheep: a new pre-clinical model. Am J Physiol Regul Integr Comp Physiol. 15(6):R500-6. 2015. Gatford KL, Kaur G, Falcão-Tebas F, Wadley GD, Wlodek ME, Laker RC, Ebeling PR, GK McConell. Exercise as an intervention to improve metabolic outcomes after intrauterine growth restriction. Am J Physiol Endocrinol Metab. Review. 306:E999-E1012, 2014. IF=4.7. Citations=1. SCImago Q1. Selected as Editors choice paper in that issue. View Glenn's full publication list in the Victoria University Research Repository. Experimental biology 2016. Symposium (Co-Chair): "New insights into exercise and insulin sensitivity". My talk: Role of nitric oxide. San Diego, USA. April 2-6, 2016. The Physiological Society conference. I suggested and organised the Symposium: Novel regulatory mechanisms in muscle metabolism during exercise. My talk: Role of nitric oxide in exercise induced glucose uptake. London. June 30-July 2 2014. Fourth International meeting on physical education and nutrition research. “Regulation of skeletal muscle glucose uptake during exercise: role of nitric oxide”. Federal University of Pernambuco. Recife, Brazil. November 8 2013. American College of Sports Medicine (ACSM) Annual Conference. Symposium entitled Neural-vascular alterations in insulin resistant disease states and treatment with exercise training. My talk: “Role of nitric oxide in skeletal muscle glucose uptake and blood flow during exercise”. Denver, Colorado, May 31-June 4 2011. American College of Sports Medicine (ACSM) Annual Conference. Organised, Chaired and presented at a Symposium entitled “Role of nitric oxide and ROS in contracting skeletal muscle”. My talk: “Role of nitric oxide and ROS in contraction-stimulated glucose uptake in skeletal muscle”. Baltimore, Maryland, June 2-5, 2010. Endocrine Society of Australia (ESA) Conference. Symposium: “Exercise: how much and what are the benefits". My talk: “Exercise as an intervention after IUGR". Adelaide. August 24-26, 2015. Australian Physiological Society annual meeting. Organised, chaired and presented at a Symposium entitled “New insights into exercise and insulin sensitivity”. My talk: “New insights into exercise and insulin sensitivity: Nitric oxide”. In: Proceedings of the Australian Physiological Society meeting. University of Queensland. Nov/Dec 2014. Gage muscle conference. “Potential role of nitric oxide in the regulation of glucose uptake during exercise and in insulin sensitivity after exercise”. Canberra. April 2014. Australian Diabetes Society (ADS) Conference. Symposium. “Interventions to prevent/improve diabetes: Exercise”. Gold Coast. August 29 2012. Gage muscle conference. “Reactive oxygen species and type 2 diabetes”. Canberra. April 2012. Prof McConell has been awarded 16 external peer reviewed research grants (totalling $AUD 3 million mainly NHMRC) and 5 industry funded grants (totalling over $AUD 1 million). 2012-2014. D. Kennaway, G. McConell and J. Owens. ($605,050). NHMRC Project Grant (1029869). Circadian rhythm disruption and metabolic function. 2011-2013: G. McConell and S. Rattigan. ($543,390). NHMRC Project Grant (1012181). Does exercise increase skeletal muscle insulin sensitivity via nitric oxide? 2007-2009: G. K. McConell, M. Wlodek and G. Wadley. ($325,065). NHMRC Project Grant (454570). Can exercise and improved nutrition normalise rat skeletal muscle mitochondrial biogenesis following growth restriction? 2006: G. K. McConell. ($45,000). Diabetes Australia Research Trust (DART). Does an acute bout of exercise activate skeletal muscle mitochondrial biogenesis and GLUT-4 expression normally in people with type 2 diabetes? 2005-2007: G. K. McConell. ($334,750). NHMRC Project Grant (350483). Is nitric oxide a central regulator of mitochondrial biogenesis in skeletal muscle cells? 2007-2008: G.K.McConell. ($640,920). Pfizer Incorporated, New York. Mechanistic Safety Biomarkers for Drug-Induced Exertional Myopathy. 2004-2006: G. K. McConell. ($382,800). Research Contract with Country Fire Authority as part of CRC Bushfire. Firefighter health, safety and well being. 2001: G. K. McConell and B. A. Kingwell. ($30,822). Pfizer Incorporated, New York. Does Sildenafil increase glucose uptake at rest in humans? 1995: G. K. McConell. ($7,000). Gatorade Sports Science Institute. Effect of carbohydrate ingestion on exercise metabolism and performance during high-intensity exercise.